After using one of the latest Macbook Pro’s one of the standout features of the machines for me is the multitouch trackpad. I know that Apple have now incorporated the same gesture based technology into their new ‘Magic Mouse‘, clearly it’s popular throughout the Mac community, but once again, Windows users are left wanting. 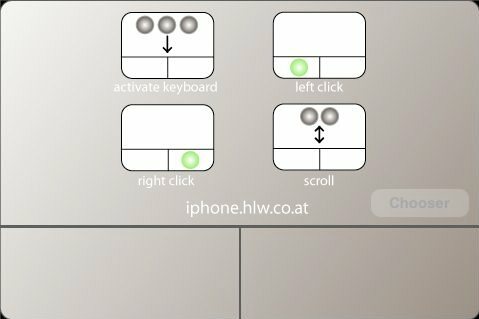 iTap Touchpad App is a brilliant little iPhone application which transforms your iPhone or iPod Touch into your very own multitouch pointing device. The application connects to your Windows or OS X computer using a wi-fi connection and allows you to control the cursor on your PC from anywhere within the range of the signal. There is support for all sorts of gestures such as two finger scrolling, pinch zoom and rotate, 3 or 4 finger swipes, providing a device extremely similar to that of the MacBook Pro or Magic Mouse. To use the device you must first download the desktop application which allows you to automatically pair the two devices extremely quickly. This is available for both Windows and OS X. Not only does it act as a pointing device, there are also added features which allow you to control music or video playback using simple play/pause and volume buttons. 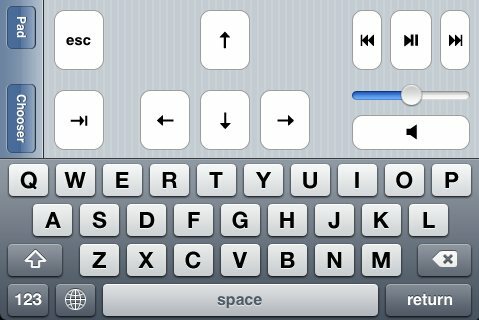 However, more importantly it doubles up as an on screen keyboard identical to that used on the iPhone SMS or browser. Lastly, there are four directional arrow keys much like on any physical keyboard. Overall, whilst using the application I found it to be responsible as long as you can get a strong wi-fi connection obviously. The iTap Touchpad iPhone app is sensitive and does feel fairly authentic. Personally, I have a Mac Mini, but no Magic Mouse so this is an ideal application for me. For just £2.39 from the app store it is well worth it.